What a treat to see a stellar cast portray screen icons of a bygone era, but highlighting issues which are just as relevant today- women combatting ageism . Jessica Lange and Susan Sarandon are fabulous as Joan Crawford and Bette Davis – two stars who despite their huge successes find that as they age and their looks fade the roles dry up have to put their long standing feud aside to make a film which could put both their careers back on track. Interestingly – it was a film that Joan Crawford had sourced and ‘sold’ the idea to a director. Baby Jane is a film classic – one that has stood the test of time- but the whole story behind illustrates the challenges faced by women in an industry where youth and looks are valued above talent. What I found interesting that while both women were feuding with each other – both were being exploited by the Hollywood machine . In fact Jack Warner coined the term ‘hagsploitation’ referring to the genre created by the release of Whatever Happened to Baby Jane – the only film they starred in together – and a project they undertook through necessity, and which succeeded against all odds when it was believed that nobody would want to see a film starring two ageing actresses. Jack Warner was proud of the fact he had created a genre which knowingly exploited actresses who were struggling to be cast in mainstream parts – and in the case of Betty and Joan , their well known feud helped to publicise the film. I loved this 8 part series (on BBC 2, but downloadable as a box set on iplayer) . You witness the struggle of two incredibly talented women coming to terms with ageing and the impact on their careers, and see just how little respect Hollywood had for its female stars and the politics and power plays within the film industry. ‘Hagsploitation’ indeed! 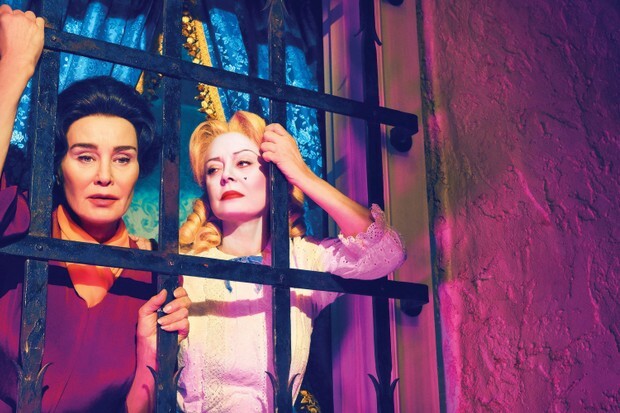 The costumes are fabulous, and both Jessica Lange and Susan Sarandon are believable as Joan and Bette. It is incredibly moving to see how both actresses who should have been friends – and would probably had more influence had they been – are encouraged to feud. Well worth watching . And it seems little has changed in more than 50 years. Tips from Joan Collins on NOT being invisible after 50!